On Wednesday, we got the news that the biggest storm since 2008 was coming on Thursday. All day we were monitoring the latest news on the storm and whether the school was going to close on Thursday. Some people laughed at the word "storm." They don't think California has storm. Some people laughed at the possibility the school would be closed because of this "storm." Having been a resident of Northern California for over thirty years, I knew it could be bad. While we are usually suffering from drought, when it rains, it could rain hard for days, and then everything breaks down - traffic lights, big trees, cars (get stuck in gigantic pools of water), power supplies, hills (mud slide), etc. At the end of Wednesday, we got the words that Oakland Unified School District, San Francisco Unified School District, and many other schools were closing on Thursday in order to avoid putting any student and school staff in danger. When I made the announcement to the entire school community, the staff members started cheering. I was extremely relieved that I didn't have to take a sick day. My voice was completely gone as I had been sick and still dragged myself to work. On my way home from work, I could feel the wind picking up speed. The sky was a dreadful shade of gray. I stopped by the store to get a bunch of canned soup. All I wanted was hot soup when I wasn't feeling well. When I woke up around 4 a.m. on Thursday morning, I noticed that the power was out. It was still out when I got up at 7 a.m. I could see BART train running from my window but all the houses around me were completely dark. I went looking for my camping stove and lamp to make breakfast. The heavy rain was steady and coming from all 3 directions. I couldn't open two of my doors without my floor getting wet immediately. The only door I could opening without forming a puddle of water inside of the house was the door to the dog run from the garage. Kelsey and Cracus stayed inside all day. I took Cracus out 3 times to go to the bathroom. He got almost completely soaked just from being out for a couple minutes. Kelsey absolutely refused to go out. She barely drank any water and didn't go to the bathroom all day. It was a treat for all of us to be able to stay home on a day like this. The weather cleared up briefly today for a change. It was the perfect chance to take the dogs somewhere so they could take a nice long walk. I have taken Cracus to Point Isabel a few times already but always kept him on a leash. I guess having a couple Alaskan Malamutes as my first dogs, I am always unsure whether a dog would just take off. Not that they were bad dogs, but Malamutes are very independent and tend to go on their own adventures. Niki and Okami escaped and went on a few trips of their own although they always managed to come home. By now I know Cracus is a lap dog. How did people ever create lap dogs? He just wants to sit on my lap all the time while I am at the desk or watching movies. He follows me everywhere when I am home. I was pretty sure if I let Cracus off leash, he wouldn't just run away to be on his own. Well, it turned out that he was more well behaved while we were out. He followed me closely and ran up to me whenever I called his name. He wanted to play with other dogs regardless of their size. Having Kelsey as his big sister, he's fearless of large dogs. He didn't run into any mud puddle or jump into the bay. He didn't bark at any person or dog and didn't act crazy at all. People thought he was cute. I have been thinking about getting a second dog for a while. I thought about what are involved in having another dog - space in the car, additional cost in food, living area, additional shedding and bathing of the dog, training, and vet bills, etc. Even though I would love to have another dog that's similar to Kelsey's size, I decided it would be easier to get a small dog. I stopped by Berkeley Animal Services and was immediately drawn to this super cute young labradoodle, who was adopted immediately a week ago but was returned due to his constantly playful nature. I could see that would be a problem for me as well but he was super cute. I almost wanted to get him out of impulse. The animal control officer gave me a book, Love Has No Age Limit, to read over and take everything into consideration before getting that second dog. It is a wonderful little book, which I highly recommend to anyone who is thinking of adopting a shelter or rescue dog. I have never even considered getting a dog from a breeder. All of my dogs were pre-owned. I ended up finding this little white dog at Animal Refuge Response in San Pablo. They think he's a poodle mix and is about 9 months old. The little guy looked so eager to get out of the shelter and is so sad when someone walks away. He would just then curl up in his little bed and wait for the next person to come by. I ended up taking him home on the same day. Little did I know he could turn into a little crazy monster. He jumps on people and Kelsey and would try to bite my hands with his little sharp teeth. He also makes this crazy wild animal noise and runs super fast. He reminded me of Gremlins with his pink lips, nose, floppy ears, and somewhat unpredictable temperament. I wasn't sure what to call the little dog, but I kept calling him crazy little circus dog. I thought about calling him Gremlin or Mogwai (from Gremlin). At the end, I figured Cracus would be perfect. It sounds like a real name but it's basically Crazy + Circus = Cracus. He probably looks pretty normal and cute in the photos above. Take a look at the way he plays with Kelsey in the video below. Kelsey tried to ignore Cracus for a couple of weeks, but I guess she finally decided that she had to try to wear down some of his energy. With my new garden, naturally I have to plant something new. Since my gardening time is now extremely limited, I decided that I needed to just get a small plant instead of trying to grow something from cuttings. I stopped by one of my favorite nurseries in the area, East Bay Nursery, to check out their fruit trees. Initially I was very interested in a persimmon tree specifically of Jiro variety, the flat round kind not the pointy kind. Persimmon trees are quite expensive, so I started looking at apricot, avocado, pineapple grava (feijoa), etc. I know with our cool weather in the East Bay, growing avocado and pineapple grava would be tricky. I went back to East Bay Nursery a few days later to take a second look. To my surprise, they have kiwi vines, which I completely missed during my first visit. I searched online for golden kiwi vines, but the only vendors selling them are in New Zealand, and they can't ship them to the States. Having been deeply in love with New Zealand, the decision was for me. I knew that in order for kiwis to fruit, there have to be a male and a female vines growing close to each other. East Bay Nursery has both male and female vines. They also have one last pot which has both male and female vines in the same pot growing next to each other. I grabbed that pot and took it home. I have been keeping it in my kitchen for now. After reading more about growing kiwis in the Bay Area, I am considering the possibility of growing it inside. Alternatively, I could transplant it in the yard in the spring. Recently someone at Point Isabel handed me a flyer about El Cerrito Hillside Natural Area. I guess it's somewhat new, and it became available through donations to preserve the land. I have been wanting to check it out. This afternoon, I took some outdated electronics to the recycling center on Schmidt Lane and passed by the sign of El Cerrito Hillside Natural Area. It was my perfect opportunity to check it out. I even had Kelsey with me! It's definitely a change of scenery from the water front view of Point Isabel. I hiked up the hill where there were benches for people to enjoy the view. I was supposed to keep Kelsey on the leash, but she refused to walk up the hills with me holding the leash. Since there were hardly anyone else around, I let her go leash free. She then followed behind me and climbed up the hill. Once we were on the top, we could see the bay and even Bay Bridge. It was smoggy on the other side of the bay, but if you look closely, you can see the bridge. I really enjoyed the short hike. For the very first time, I have so many passion fruit that I am able to give bags away to friends, neighbors, relatives, and co-workers. I can have several passion fruit everyday for months. It's end of September, and the vines are still full of fruit, and more fruit is forming from recent bloom of flowers! When I give them to people, the first question is always, "What is that?" with a puzzled look. Even though passion fruit juice is sold in every grocery store and Jamba Juice, few people around here have seen passion fruit in its natural form. Once I tell them, they are amazed. They want to know where I got them. When I tell them that I grow them, they are even more amazed. Since all the fruit is coming from just one passionfruit plant, I figured it is time to propagate it. I have promised to give baby passionfruit vines to a few friends. Today is overcast and drizzling. It is the perfect condition to make some cuttings. I found a spot in one of the vegetable beds to place my tray and stuck a bunch of cuttings in it. I think I got the original cuttings from a friend back in summer 2009 or 2010. It took about 5 years to get a full harvest. My next challenge will be growing golden kiwi along side of passion fruit. I don't know anybody who has a golden kiwi vine, so I probably need to order my first plant online. People have been asking me where I stayed during my epic Middle Earth trip. In Auckland, I stayed at a placed called Nomads Fat Camel at 38 Fort Street. I picked it because the price is cheap. I booked a double room with no window (although it actually had a window) at $60 per night. I stayed there for 5 nights. The front desk staff is friendly, and every night they offer free snack size meal to guests. The problem with this place is its next door establishment called "Lipstix" Massage Parlor. I don't really think it's a massge parlor but more like a night club that opens all night. They would have the doors wide open every evening and blast music until sunrise. Will I stay there again? No. There are a lot of hostels in the area, so there is no shortage of budget accommodations. In Wellington I stayed at The Setup Accommodation, which is also a budget hotel, located at 15 Dixon Street. 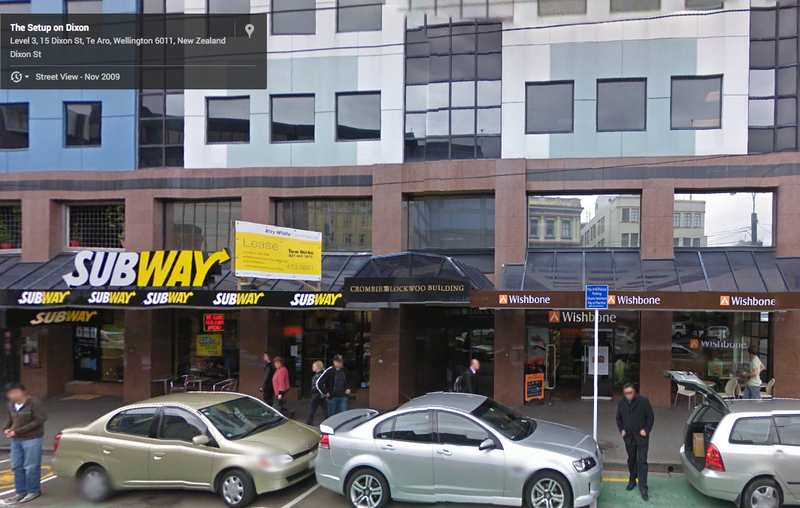 Downtown Wellington is very walkable. I could walk to the train station on the other side of the town in 20 minutes. I had a single ensuite room, which is a single room with private shower for $70 per night. Unlike the bare room at The Fat Camel, The Setup room has flat screen tv in each room, free WiFi, mini fridge, coffee/tea maker, and assorted tea bags/instant coffee packs in each room. I was pretty happy with the unlimited WiFi. Will I stay here again? Yes! Wellington was going to be my last stop, and I picked a real hotel to stay with. Hotel 115 at 115 Worcester Street is a new hotel that opened up after the earthquake. The cost is $115 (New Zealand Dollar) per night. I guess they like to stick to the number 115. I was immediately impressed with its decor. After I entered my room, I stepped out and took a video clip of it. 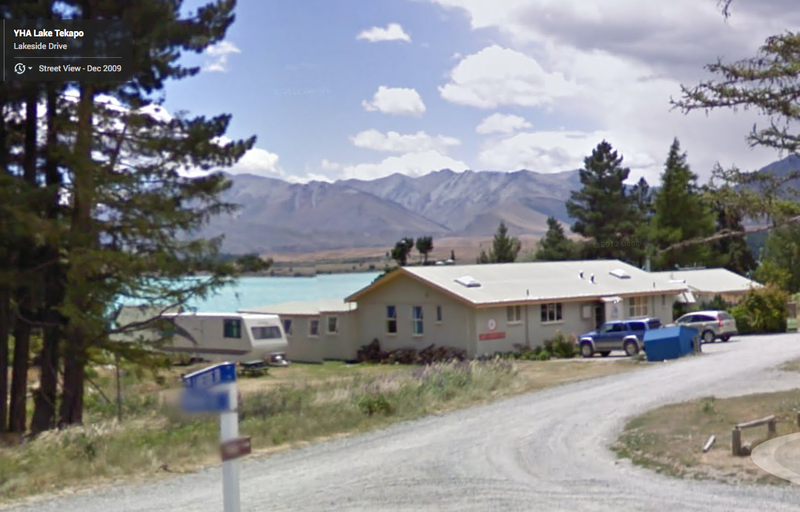 I stayed there two nights then headed to Lake Tekapo. I stayed at YHA Lake Tekapo for 2 nights. The hostel is right next to the lake, so the view is fantastic, but the price was almost as much as Hotel 115. I had a double private room with shared bath, and it was $90 (NZD) per night. The room was bare just like the one at Fat Camel. My room also happened to be right next to the men's bathroom and the kitchen, so it was noisy most of the time until quiet hours. Will I stay here again? Probably not. Luckily I had one more night at Hotel 115 before I headed back home. I got a different room with a different layout. It turned out that every room is a little different at Hotel 115 due to the shape of the building. Will I stay here again? Yes! I had plenty of warnings from New Zealanders about the state of Christchurch before arriving its city center on Monday, July 14th. The city is covered in orange cones and construction fences. Many buildings and businesses are boarded up and clearly unoccupied. It feels more or less like a ghost town. The Cathedral used to be a gathering place for the local people, and now it's a broken empty shell. Many streets are closed off due to constructions. Down the street from the cathedral is Canterbury Museum, which appears to be undamaged from the earthquake, is open to the public free of admission. One of its exhibitions is Quake City, which is a "multi-media attraction designed to inform, engage and educate locals and visitors to Canterbury about the seismic events that have occured since 4 September 2010." I spent most of my time in the museum looking at the videos and photographs of the damages the quakes had done to the city. Having experienced 1989 San Francisco earthquake myself, I felt very emotional looking at the photographs. It made me upset when some young children running around in the exhibition as if it was a lighthearted playground. 185 people were killed during the quake, I think the parents should either take this opportunity to educate their children or not taking them to this part of the exhibition. While I was at Lake Tekapo a couple days ago, I chatted with a older man at Tekapo Springs counter. I asked him how long he's been living in that area. He told me that he moved there a couple years ago after losing everything in Christchurch during the earthquakes. He said that he can't possible stay in Christchurch because it simply upset him too much. People who have experienced earthquakes in such multitude simply will never forget it. I still remember 1989 earthquake vividly. I hope when I come back to Christchurch next time, it will be much different. New Zealand is famous for its birds. Everyone knows Kiwi birds, and New Zealanders call themselves Kiwis. Kiwi birds are critically endangered and nocturnal. Even though I got to see a couple of them at the Kiwi House of Te Puia, I couldn't take pictures. I had a much closer encounter with Kea at Auckland Zoo. The Kea is very curious and intelligent. It came really close to me in the zoo. I had to remind myself not to pet it. They are considered vulnerable because more than 150,000 were killed by hunters before 1970. While I was hiking in Kaitoke Regional Park in my attempt to reach Rivendell, a bird with a tail resembling a white fan kept circling around me. I had never seen a bird like it, so I took a few pictures of it. It only showed the fantail while it was flying, so the photo above was the best one I got. Sure enough I saw its pictures in souvenir stores. They are called New Zealand Fantail and of course unique to New Zealand as well. While in Lake Tepako, I came upon countless birds and other animals like the bunny above with its bird friend! It was during sunset, so I couldn't get a clearer photo of the dual. The bird was just hanging out with the bunny. There are also many Paradise Sheldducks among other ducks living around the lake. The one with white head is female and the all dark one is male. They are unique to New Zealand as well. I feel so fortunate to see all these native New Zealand birds during my travel. Scenes from Fellowship of the Ring were filed on Mt. Victoria. This is the only sign. I am having a lot of fun reliving the Lord of the Rings craze from 13 years ago. I don't know why I didn't come to Middle Earth sooner, but I know I want to come back here soon. Now that I have visited many of the locations on several express tours, I will be able to come straight here next time and only spend time at these locations. During Wellington Rover's Lord of the Rings tour, the guide took us to the top of Mt. Victoria in Wellington. Many scenes from Fellowship of the Rings were filmed here but the only indication is the little sign shown above. The guide showed us photographs of the exact spots and the scenes. It was a little embarrassing for me to admit that I have only seen Fellowship of the Rings once, but I remember those scenes vividly. That's how powerful that movie was. The weather forecast for Wellington was rain almost everyday while I was there. Little did I know the rain was what we call sprinkle in the Bay Area. It was hardly anything. If I had known better, I would have booked an all day Lord of the Rings tour with Wellington Rover instead of a half day tour. I took a train and then a bus in the morning trying to get to Rivendell. The bus only goes as far as this sign shown above. I wasn't sure exactly how far 6km was. I was hiking uphills on State Highway 2 next to the cars trying to get to Rivendell. Eventually I found a fence and climbed over it into Kaitoke Regional Park trail so I didn't have to hike right next to the cars. Rivendell was all the way on the other end. I will have to save it for my next Middle Earth trip. On my first day in Wellington, I found a flyer for Hassle-free Tours' Lord of the Rings tour in Christchurch. I immediately made a reservation online to ensure a spot for the all day tour. We actually climbed all the way to the top of Mt. Sunday (the mountain shown in photo below), where Edora was filmed. A castle was built for the filming, and it was taken down after the filming was over. As I climbed up the hill with ease, I knew all the hiking I had been doing had paid off. A month prior to my trip, I hiked everywhere with a weighted down backpack so I could train myself for endurance. My purple UGG Adirondack Snow Boots have proven to be worthy. They are both skid resistant and waterproof. I was able to climb up and down the muddy hill with confidence and then walk across the shallow creek to clean the boots without getting my feet wet. It felt amazing to be on top of Mt. Sunday. 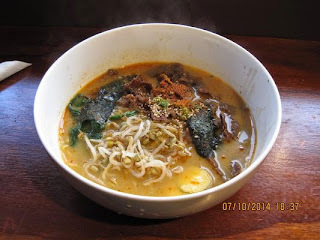 I have a thing for ramen. Here I came all the way to New Zealand, and I have been looking for ramen just so I can compare it with ramen back home, ramen in Tokyo, ramen in Toranto, etc. I passed by a ramen shop on my last day in Auckland while going to the airport. I just wasn't hungry at the time, so I had to let it go. 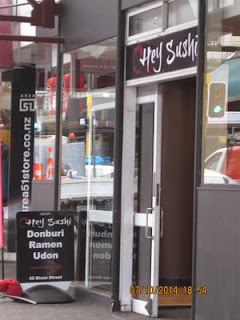 On my first day in Wellington, I passed by Hey Sushi on the way to my hotel. I noticed its sign says "ramen." 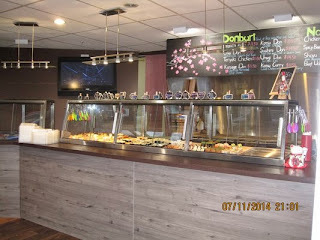 The place is mostly for take out (take away as they say in NZ). It has 5 stools and 2 small bars against the windows for people who want to dine in. I just wasn't sure, so I took a quick look and moved on. For the next 2 days, I walked all over town looking for ramen and all I found was udon. Udon just isn't the same, and I have no special feelings for it. Finally I went back to Hey Sushi and ordered a spicy beef ramen. I was pleasantly surprised. It's not tonkotsu ramen, but it was good.It came with many slices of beef, half a stewed egg, spinach, and a bunch of other toppings. I was so happy and couldn't believe I didn't go there earlier. Today, it started to rain like a real winter day, which gave me the perfect excuse to have ramen again! I went back there after coming back from a long hike (tramp, they call it here). 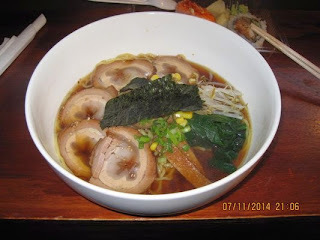 I ordered shoyu ramen with chashu (bbq pork) this time. It looked great! It came with so many slices of chashu not just 2 or 3. I also picked a combination of sushi as appetizers (not that I needed anything to make me hungrier). They were good, too! The prices are also very reasonable. 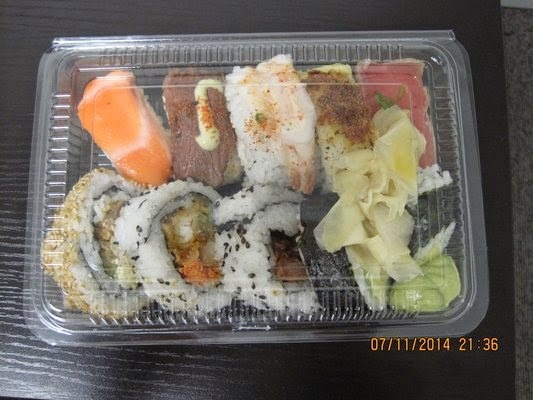 If you go there after 4:30, you can get boxed combination sushi for $7 a box (closing sale). These pieces are much bigger and better than the ones St Pierre's Sushi. Before I left, I picked a $7 pre-boxed sushi so I can eat later as snack. Oh, I also like that it has a flat screen TV that constantly plays Japanese rock concerts. When I walked in today, Mika Nakashima was performing Glamorous Sky. I love that song. Here are the 3 things any Middle Earth visitor should try. One is kiwi especially the golden ones. Green ones seem to be very common around the world, but I haven't noticed gold ones until recently. I was able to get a box of 10 from New World Market for $1.99 when they were on sale. It even came with a little "kiwi" spoon, which I am keeping with me as a souvenir. The golden ones are less tart than the green ones. I like them a lot. New Zealanders are very proud of their coffee. They have a popular coffee drink called "flat white" here. It's not latte, and it's not exactly cappuccino. I had to look it up on Wikipedia, and it was developed in Australia and New Zealand in the 80's. I can get a small flat white from a 24-hour convenient store for $1, which is fully self service. This machine is amazing. It makes 9 different coffee drinks. Alternatively, You can go to one of the many independent coffee shops all over town and have someone prepare the coffee for you. I stopped by The Coffee Club this morning to get a cup of flat white with some pastry on the side. Starbucks isn't too popular here, which is just fine by me. Although you can definitely add sugar to your flat white, I find it so good that I just drink it straight. I found any dairy product to be excellent in this area, which makes total sense since it is their number one export earner. I had some amazing New Zealand yogurt yesterday, too. Another thing to eat is a hamburger. A burger can cost anywhere from $5 to over $20 here depends on where you go. It might be cheaper at Burger King and McDonald's, but I wouldn't want to go to one of those places. Burger Fuel seems to be a good place to go as it features 100% grass fed New Zealand beef patties. I went there today and had a Hamburgini (one of their smaller burgers) with kumara (sweet potato) fries. They were great and cost only $11.80 for both. I couldn't even finish the fries.